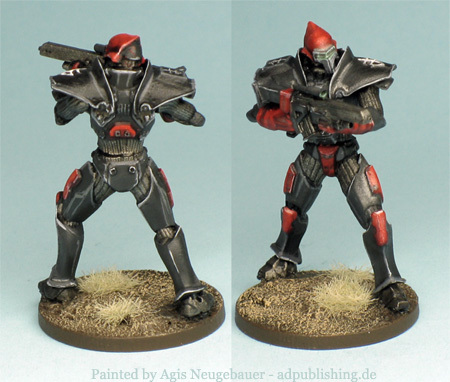 Hussars are the regular line infantry of the Bauhaus Corporation. 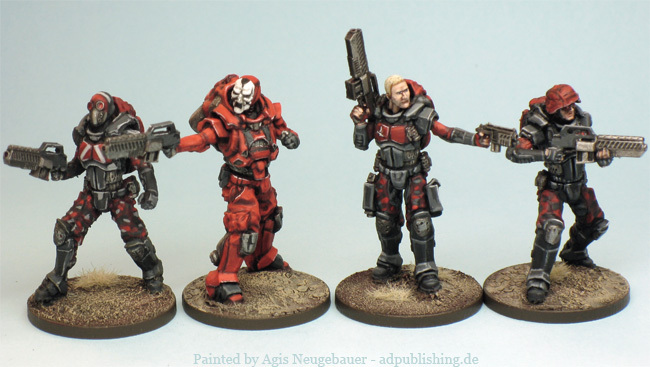 They are among the best equipped and armed of all the regular corporate armies and as every citizen of Bauhaus is expected to serve in the military at some point, they are never without a steady flow of recruits. The above mini is from the Warzone Resurrection KS, I reshaped the legs (IMO the stand was too wide) under hot water, works like a charm! After that the mini was mounted on a 25 mm MDF base. The Grizzly from last years Kickstarter finally arrived! It is a very fine kit, you get some big fat resin blocks to assemble. Everything fits more or less smoothly together, some minor fitting problems can be easily covered. More on that later. I am happy! 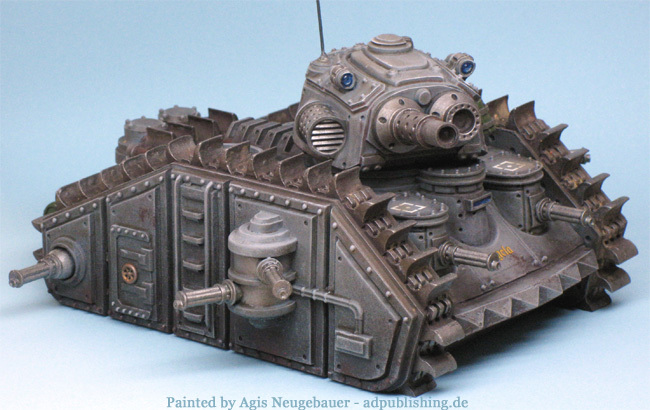 The tank is a Warzone classic, featured on the old Bauhaus RPG book and once even released as a model. It has some strange design elements, like the blade like tracks or the anti infantry gun on the rear axle! For me this just adds to the charm of this brutal design! The fuel tank is from a GW kit and the wooden box is a resin after market tank storage piece. 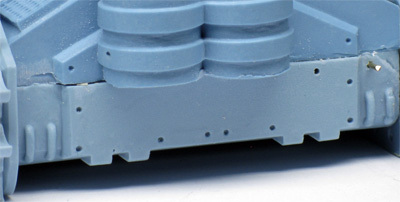 I added them since some ugly fitting lines were originally at the rear of the kit (see above). 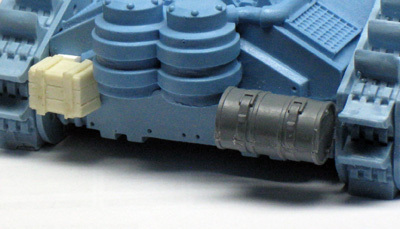 The main turret sat a bit low (See A). I really feared that some of the finer details would be damaged during play, so I had to raise it a bit higher. IMO still a fitting look, like a WW II KV-2! The solution was simple, I added a MDF base (B) and voila, all fine (C!). 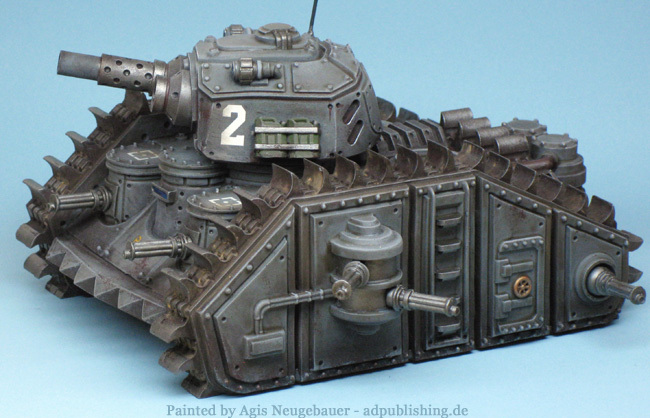 And since almost every time someone is asking about a scale comparison, here is the Grizzly together with a GW Leman Russ! “It is said that the formation of the Brotherhood rewrote the course of history. The Brotherhood was formed in 2275 A.D. by the first Cardinal, Nathaniel Durand, following the end of the First Corporate Wars. It's foundation drew all the Megacorporations together into unity. A new calendar was created in the year of the Cardinal's inauguration and dates were henceforth written as Y.C. -In the "Year of the Cardinal". From it's earliest days, the Brotherhood established themselves as a martial force and not simply a clerical order guiding humanity with words of wisdom and peace; the times are too dark, the enemy too prone to slaughter for such a charitable expression of faith. Did not the Cardinal himself lead an army of thousands against the "Apostle of War" and did he not smite down and cleave into bloody ruin many a hell-spawned demon sent against him? He did; and as in all things, the Brotherhood follows what Cardinal Durand taught them. Capitol was the first Megacorporation to fully appreciate the commercial viability of colonising the solar system. Taking the initiative, they invested a massive amount of resources in the construction of a permanent launch facility and resource depot on Earth's Moon (Luna). Their investment paid huge dividends as traffic throughout the solar system increased and all of the Megacorporations began using the Capitol base. They developed a reputation for logistical expertise that persists to this day, for their supply lines and rapid deployment record is by far the most impressive of all the corporations. Captain Henry Thomas is the commander of the 44th Airborne Calvary, more commonly known as the Ghost Raiders. The Ghost Raiders and Thomas specifically, take a quantifiable portion of the media limelight of the Capitol military forces. They are well aware of the part that they play in keeping morale high amongst the citizens of Capitol and they relish the attention. They are far from camera shy and will play up to military correspondents with farfetched tales of heroics, often significantly elaborating the truth, knowing that their words will be lapped up by the Capitol citizenry. However, the gung-ho heroics of the ‘drop-jockeys’ (as the media like to call them), hides a high mortality rate, even when compared to the other Airborne corps. No modifications at all, just an incredible good sculpted mini! Hopefully my paintjob gives it credit. 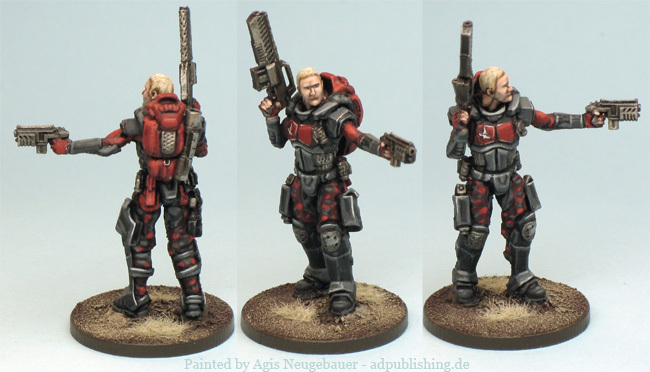 The grunts of the Capitol forces, the Light Infantry are an omnipresent sight in every Capitol Warzone. Each and every one is armed with a standard issue combat knife, M50 Rifle and their trusty under slung grenade launcher. 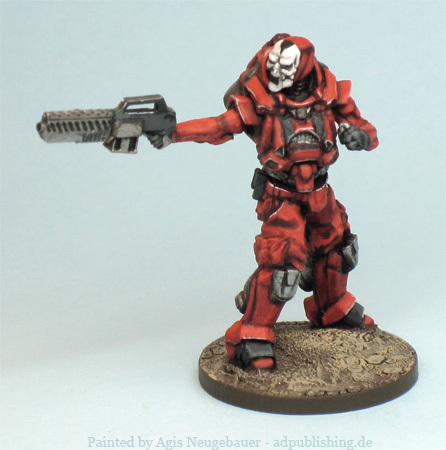 The above mini is from the Warzone Resurrection KS, I did a head swap however. 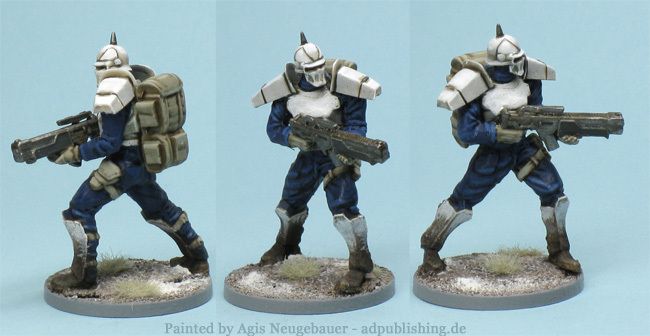 The Light Infantry helmet is true to the original artwork, but somehow it does not work for me. After that the mini was mounted on a 25 mm MDF base. Airborne Cavalry are a highly respected part of the Capitol Military force and recognised for their insanity. Nothing makes these soldiers happier than the rush of free falling, whilst firing their Lance Rocket Launchers and scattering their foes. 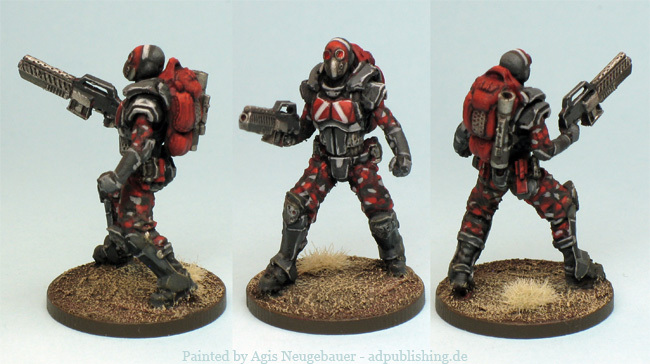 The above mini is from the Warzone Resurrection KS, I only used the Airborne head and backpack, otherwise right out of the box. The mini will serve in double duty not only as part of the 44th Airborne Calvary but also as an Arkham Knight crew mercenary. 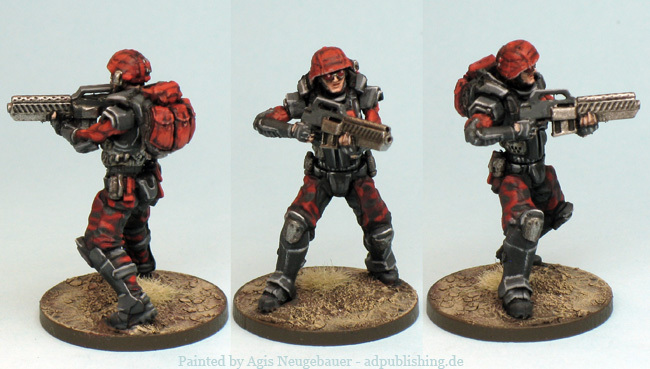 The Martian Banshees are one of the Capitol Corporation’s most unusual Special Forces units. It recruits only from those who have lost families to the operations of Mishima or the Dark Legion in conflicts on Mars. Banshees are desperate and deadly men and women who have sworn to sell their lives dearly in search of vengeance. They are an elite airborne unit which is dropped on special Banshee rocket packs into the very heart of any conflict. The howling wail of their engines and the unsettling decoration of their face masks give the unit its prominent name. As with Thomas, no modifications at all on this mini.